Ron Hall, author of Same Kind of Different As Me, spoke at the S. Truett Cathy Poverty Summit on Feb. 1, 2019, where he was greeted by Dr. Sue Head, vice president for cultural affairs and dean of character education, at College of the Ozarks. POINT LOOKOUT, MO. 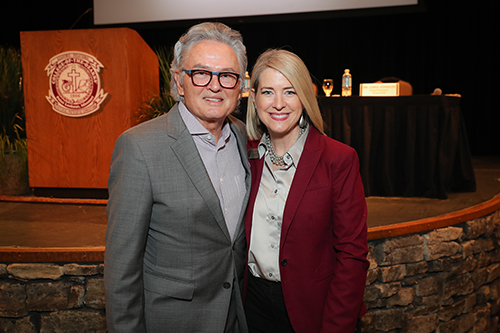 — College of the Ozarks hosted Ron Hall, best-selling author of Same Kind of Different As Me on Thursday, Jan. 31, for a convocation and on Feb. 1, 2019, for the S. Truett Cathy Poverty Summit. Hall spoke on the impact that his late wife, Deborah Hall, and homeless man Denver Moore had on the community and how they influenced him to care him about the impoverished. Hall had enjoyed a successful career as an international art dealer until his first encounter with Moore in 1998. Their story, immortalized in the New York Times best-selling book, Same Kind of Different As Me, inspired people to take off their racial, social, and economic blinders in order to find common ground. Almost 20 years later, Hall has become a tireless advocate for the homeless. He travels across the nation building awareness and has raised nearly $100 million for the homeless. Hall has received numerous philanthropic awards and recognitions, as well as authoring Working Our Way Home and For Art’s Sake. The S. Truett Cathy Poverty Summit, which was hosted by College of the Ozarks, brought together Hall and other acclaimed speakers to provide inspiration and the backdrop for area educators, business leaders, and community members to learn and share concerns.